>> Slow? 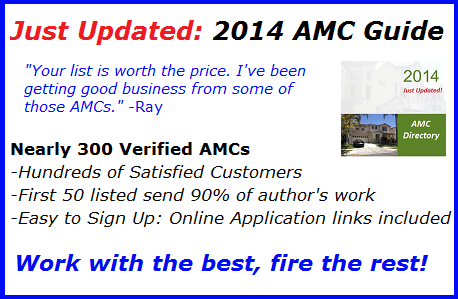 Get Busy: Work directly with clients, bypass AMCs, get paid full-fees and diversify your business. Click here to learn more. Editor’s Note: This story is taken from the upcoming print edition of Working RE. The magazine will begin mailing in a few weeks, keep an eye out for it! Am I a Subscriber? Even a seasoned appraiser has to get back to basics. Every appraisal assignment begins with understanding what is considered the appraisal problem. I’ve always had a problem with the word “problem”! It gives a negative connotation. I prefer using the words “appraisal assignment” rather than “appraisal problem.” In any case, you need to know what your appraisal assignment/problem is and how you plan on accomplishing your goal, which most likely is to develop your opinion of value, which in most assignments means the market value. This is necessary in order to establish your Scope of Work. Before you start determining your Scope of Work, the first thing you need to determine is who your client is and any other possible intended users. From here you need to know the intended use, type of value (also referred to as the purpose of the assignment), and if you are to provide a current, retrospective or prospective value. Then you can start asking additional questions, such as the relevant characteristics of the property to be appraised, and begin looking up the information in the public records and Multiple Listing Service. If you are providing a retrospective value, then you will have an extraordinary assumption (an assumption, if found to be false, could alter your opinion or conclusion, such as the condition of the improvements on the effective date of value). If you are providing a prospective value, then you will have a hypothetical condition (a condition which is contrary to what is known to exist, such as a proposed improvement to the property). I suggest that you must know all of the above prior to quoting an appraisal fee. I realize this might be difficult if you are preparing appraisal reports for a lender, but after a few times of wishing you had known more about the property prior to quoting a fee, you will start asking questions ahead of time. The Appraisal Institute’s (AI) book, The Appraisal of Real Estate – Fourteenth Edition, states that Scope of Work is “the type and extent of research and analyses in an assignment.” The definitions section of the 2014 – 2015 Uniform Standards of Professional Appraisal Practice (USPAP) defines Scope of Work as “the type and extent of research and analyses in an appraisal or appraisal review assignment.” The words “appraisal or appraisal review” were added in the 2014-2015 edition of USPAP. The 2006 USPAP and earlier editions had the Supplemental Standards Rule specifically laid out with the requirements for following Fannie Mae and other Government Sponsored Entities (GSE). This Rule required the appraiser to prepare the appraisal report to follow their guidelines in addition to USPAP standards. This all changed starting in 2008 when the Supplemental Standards Rule was eliminated and the Conduct section of the Ethics Rule was modified to identify the need for an agreement between the appraiser and the client when accepting an assignment. 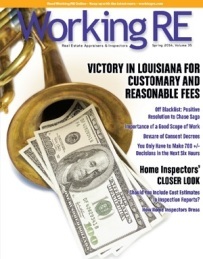 In 2008, the Scope of Work Rule stated that it is the appraiser’s responsibility to identify the problem to be solved. However, this does not prevent the appraiser from communicating with the client regarding the Scope of Work, especially what approach(es) to value will be utilized to arrive at an opinion of value or other conclusions. Scope of Work is specifically mentioned in USPAP, Standards Rule 1-2 (h): determine the Scope of Work necessary to produce credible assignment results in accordance with the Scope of Work Rule (page U-18 in the 2014-2015 USPAP). Therefore, one only needs to concentrate on the Scope of Work Rule in determining what is required by the appraiser. Each appraisal and appraisal review assignment requires that the appraiser (1) identify the problem to be solved; (2) determine and perform the Scope of Work necessary to develop credible assignment results; and (3) disclose the Scope of Work in the report. This article will concentrate on the latter two of the three requirements. Who determines the Scope of Work for your appraisal assignment? You do. I can’t stress enough the importance of you discussing your Scope of Work with your client and also to have written in your report which approaches to value you intend to use and which you do not intend to use and why. Without a proper Scope of Work, your report can possibly be misleading, incomplete and result in a dissatisfied client. While the Fannie Mae forms have a preprinted Scope of Work, read it over and see if it meets both you and your client’s expectations. While the cost approach is most likely not necessary for the value of a single family residence (unless proposed, under construction, new or relatively new), no appraiser wants a call from the client inquiring why the cost approach was not performed, especially when you considered it to not be a reliable indicator of value. Most likely, the client wanted it for the replacement cost new for insurance purposes, which is why you need to find that out prior to accepting the assignment. So check with your client regarding their expectations prior to you preparing your written Scope of Work. Other than establishing the assignment (i.e. valuing a house, condominium unit, commercial property, etc. ), your Scope of Work is the most important beginning part of your assignment. No matter how complicated your assignment is, determining how to value your property will give you the basis and steps needed to start and complete your appraisal. The Scope of Work lays out your foundation in valuing your subject property. The highest and best use will determine the selection of comparables. Who Determines if Your Scope of Work is Acceptable? Theoretically, your Scope of Work must meet the acceptance of your peers and the expectation of parties who are regularly intended users for similar assignments. Who are your peers? In essence, they are those appraisers who have experience in performing the type of assignment you are engaged in. For example, if your assignment is to value or review a single family residence, a peer would be an appraiser or a reviewer familiar with the methods and techniques in performing that assignment or a similar assignment. If your assignment is for the valuation of a special purpose building, then most likely you will utilize only the cost approach. Your peers must be familiar with the type of property that is the subject of your assignment and perhaps even be one who has appraised that type of property or reviewed reports of special purpose buildings. What about the expectation of parties who are regular intended users for similar type assignments? Those parties could be an Appraisal Management Company (AMC) or the financial institution. Therefore, if the typical intended user either requires or expects the cost approach (or even the income approach) to be performed, then your Scope of Work should include it unless you can convince your client that it is unnecessary for a credible assignment result. As USPAP states, “the appraiser must be prepared to demonstrate that the Scope of Work is sufficient to produce credible assignment results.” (2014-2015 USPAP, page U-13, lines 393 and 394). If you refer to the Scope of Work Rule (2014-2015 USPAP, page U-13), it states that the Scope of Work includes, but is not limited to: (1) the extent to which the property is identified; (2) the extent to which tangible property is inspected; (3) the type and extent of data researched; and (4) the type and extent of analyses applied to arrive at opinions or conclusions. Remember, your Scope of Work must result in a credible assignment result. The requirements by USPAP are more detailed than what is required by Fannie Mae. Therefore, you might want to consider preparing a more complete Scope of Work in an Addendum within your form. You can use the same Scope of Work in a narrative appraisal report. The Scope of Work in the Fannie Mae form is somewhat generic, stating that the appraiser must at a minimum perform a complete visual inspection of the interior and exterior areas of the subject property (FNMA 1004 form) or exterior areas only of the subject property (FNMA 2055 form); inspect the neighborhood; inspect each of the comparable sales from at least the street; research, verify and analyze data from reliable public and/or private sources and report his or her analysis, opinions and conclusions in the appraisal report. This Scope of Work is satisfactory for Fannie Mae requirements but not for USPAP. I used to write my Scope of Work as a generic description with what I considered was necessary, including information gathered regarding the subject and comparable sales, which approaches to value were considered and why the other approach(es) were excluded from my analysis. While this basically remains the same, I started to realize that Scope of Work was meant to be specific to the assignment, not a generic description. Therefore, I suggest that when you create the Scope of Work, customize it to your assignment. Below is the Scope of Work that I use as the basis to customize. You may consider using it and make any changes needed. As part of the Scope of Work, the appraisal was developed by gathering information on the subject from the public records (indicate the specific name of the public records source), the (name of) software program and the Multiple Listing Service (MLS). This includes the legal description, owner of record and sales of the subject within the past three years and current or past listings within the past 12 months of the date of this appraisal. This Appraisal Report sets forth only a summary of the comparable sales and their comparability to the subject and the appraiser’s conclusion. Supporting documentation is retained in the appraiser’s workfile or located in the appraiser’s office. The subject was physically identified by an interior and exterior visit of the subject property. The only approach to value considered applicable to this assignment is the Sales Comparison Approach. The Cost Approach would only be applicable if the structure was proposed, under construction or relatively new. As the house was originally constructed in (year built), the estimated depreciation of the improvements would be too subjective and therefore not considered a reliable approach to value. The Income Approach typically utilizes sales that were also rented to establish a gross rent multiplier, which would be utilized with the estimated market rent of the subject. Due to no comparable sales that were also rented, the Income Approach to value was not applicable since a Gross Rent Multiplier cannot be established. In the Sales Comparison Approach, closed sales were utilized in comparison to the subject property. This would include sales outside of the subject neighborhood if deemed necessary. Adjustments were made for any significant differences between the comparables and subject. Information on the comparable sales was based on a cross section of the public records, (name of) software program, Multiple Listing Service (MLS), an exterior observation from the street and if possible, verification with the listing agent or other parties to the sale. The gross living area for the subject was based on measurements by the appraiser and the gross living area for the comparables was obtained from (state source here). You can alter the Scope of Work stated above to meet your specific needs. The above not only satisfies the 2014-2015 USPAP Standards Rule 2-2 (a) (vii) which states: Summarize the Scope of Work used to develop the appraisal, but also satisfies the latter portion of Standards Rule 2-2 (a) (vii) which starts with: Summarize the appraisal methods and techniques employed and the reasoning that supports the analyses, opinions and conclusions; exclusion of the sales comparison approach, cost approach or income approach must be explained. The review appraiser has a different Scope of Work. USPAP indicates that a review appraiser has a broad flexibility and significant responsibility in determining the appropriate Scope of Work in an appraisal review assignment. As per the comments section of Standards Rule 3-2 (h) (2014-2015 USPAP, page U-30), a review appraiser can use information that was available to the original appraiser and should have been considered. Therefore, if a review appraiser uses such information, they should state in their Scope of Work whether the new information was available to the original appraiser. Also, the review appraiser may use information that was not available to the original appraiser in the normal course of business (such as a correction in building or lot size). However, the review appraiser cannot use that information in their development of an opinion as to the quality of the work under review. Quality of the work refers to any mistakes or misapplication of appraisal methods and or techniques. In conclusion, the Scope of Work is one of the most important aspects in an appraisal assignment and should be created immediately following the determination of the appraisal problem. Again, keep in mind that the Fannie Mae form has its own printed Scope of Work. You just need to expand it in order to satisfy USPAP requirements. Philip G. Spool, ASA, is a State-Certified General Real Estate Appraiser in Florida, appraising since 1973. Formerly the Chief Appraiser of Flagler Federal Savings and Loan Association, he has been self-employed for the past 20 years. In addition to appraising, he is an instructor with Miami Dade College, teaching appraisal courses and continuing education. He is Vice President and Chairman of Real Estate Programs with the Greater Miami Chapter of the American Society of Appraisers. He can be reached at pgspool@bellsouth.net. See how to convert to a paperless office and how it increases efficiency, cuts costs and leads to better record-keeping. See how to successfully defend yourself whether you’ve committed any violations or not. Andersen levels the playing field by explaining the State Board complaint process- what states are looking for, how to understand the charges filed against you and how to appropriately defend yourself. This is a great article! It would be nice to remind appraisers that once they enter into a formal contract with a lender, they are bound by the lender’s scope of work and contract law, too, unless the lender’s scope would somehow violate USPAP.